Ordered henna design eBooks for inspiration? 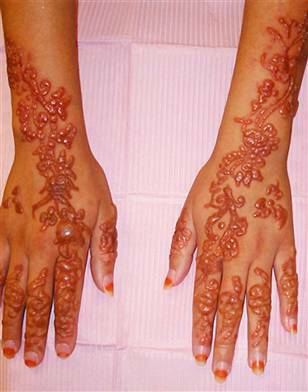 With over 20 henna design and educational eBooks to choose from I hope you found more than one! 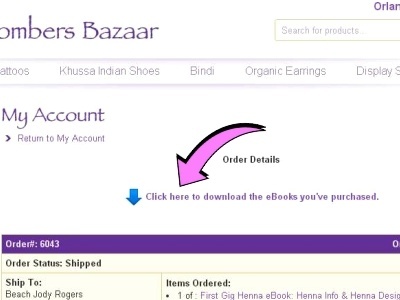 It's easy to access and download your henna eBooks at Beachcombers. 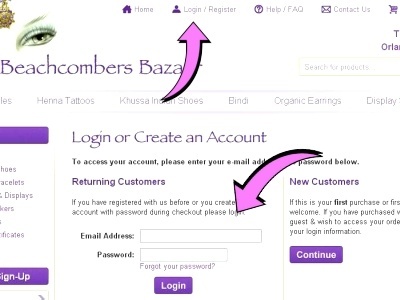 All eBooks require you to register for a Beachcombers account (enter a password during checkout). 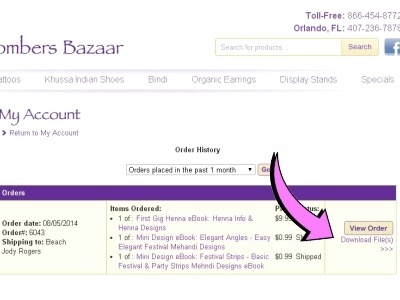 All eBooks paid by credit card are available via immediate download on the "Order Complete" screen. If you got a free eBook or did not use a credit card to pay, you will NOT see the BLUE arrows. 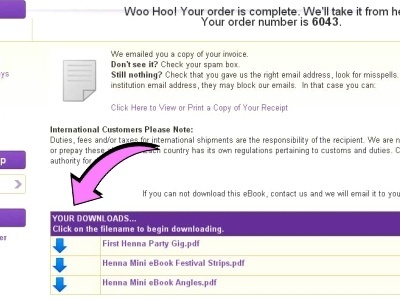 A link to download the eBooks will be emailed to you within ONE business day. Look for the moving BLUE arrow(s), and click on each link to download that eBook. Save the eBooks to your computer as in the sample below. If you lose your eBooks, you can access them directly through your Beachcombers account at any time. Log in to your account using the email and password you selected. 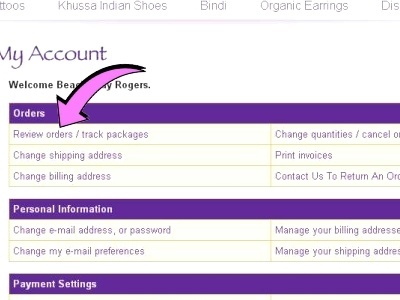 Click the "Review Orders/Track Packages" link. Click the "Download File(s)" link. Look for the moving BLUE arrow and click on the link. All that is left to do is enjoy your fabulous new henna eBooks! Bindi have a rich history of symbolism and meanings in many different cultures. Bindi can have either cultural or religious significance, though sometimes they are just a fashion accessory. Though most people think of bindi as the reusable body stickers commonly found today, bindi, which literally means "dot", were typically perfectly round dots of sindoor powder, kumkum (red turmeric) powder, or saffron powder applied by hand to the forehead. Bindi are typically worn on the forehead in the space slightly above and between the eyes. This is also known as the sixth chakra or third eye and is the point one embraces while meditating. It is the space which holds wisdom and concentration. These beliefs makes wearing bindi very symbolic when worn on such a powerful energy area of the body. Some cultures actually tattoo symbols (crescents being popular) on the forehead to bring blessing and luck, as well as to ward against the evil eye. These tattoos are also known as bindi. Wearing bindi on the forehead is also thought to be a way to pay honor to ones intellect. Both women and men often wear bindi for this reason. Women all over the world and of many different cultures embrace these meanings in bindi. Bindi and its symbolism are not limited to one culture or religion. When my daughter was young, she had problems concentrating in school. We used bindi as a tool to help her focus. She did distinctly better on tests when she wore bindi than when she did not. The energy of the body is not to be discounted in its power! For many Hindu women bindi simply means the marital status of a woman. Red means married and black means single. Today, rather than plain red or black dots, bindi body stickers come in a range of colors, sizes, and styles often adorned with real crystals and other decorations. For many Asian and Western women alike, bindi have become a fashion accessory. Just look at the fancy bindi worn on Bollywood stars, and the bling of fashion is unmistakable. Bindi body stickers are not just worn on the forehead any more. 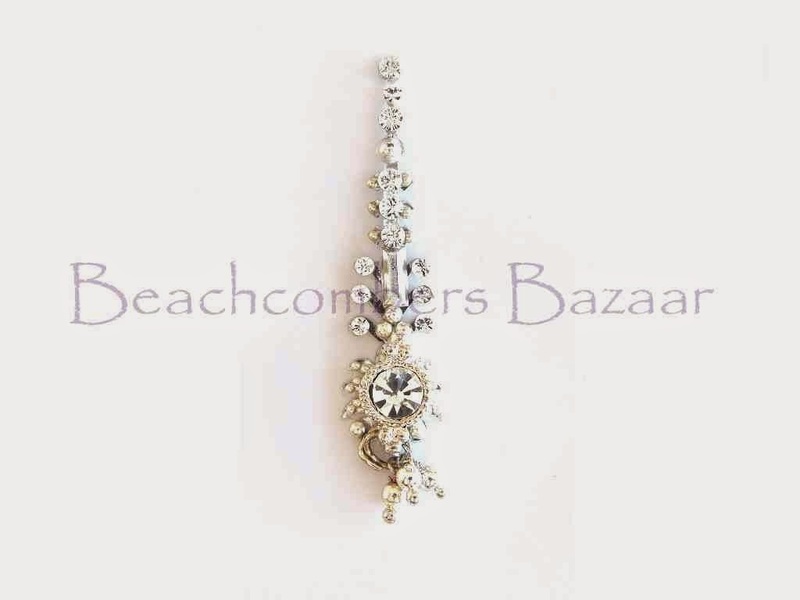 You can find bindi worn at the corners of the eyes, around belly buttons, and worn as a "floating" necklace. How you choose to wear bindi is up to you. 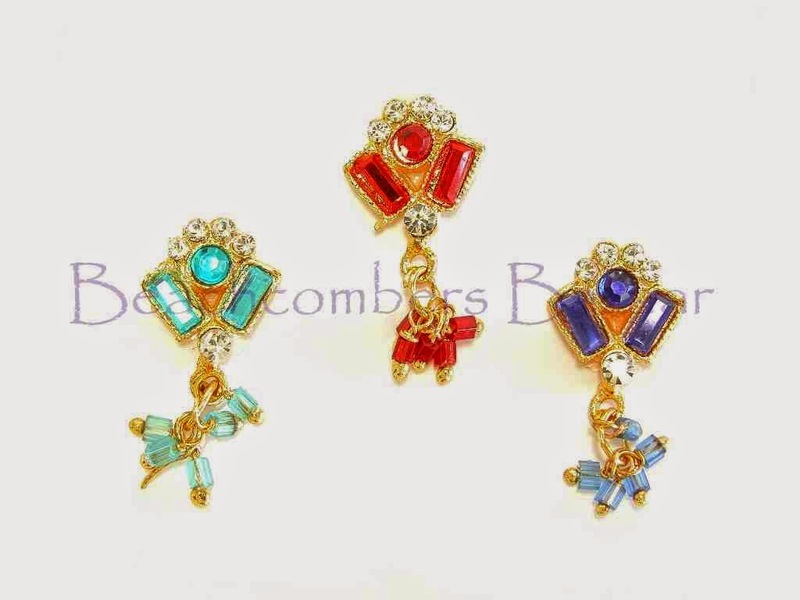 Wear it with symbolism and meaning or wear it as a fashion accessory. However you choose to wear bindi, enjoy it!